I took part in the Game Chef 2010 contest for designing roleplaying games upon a given theme and a list of ingredients. (Like the Iron Chef, I assume.) The theme was Journey, and the ingredients (of which you’re supposed to use three) were Desert, City, Edge and Skin. I thought, what roleplaying on some level isn’t about a journey on the edge between the desert and the city? But skin? That’s something interesting. My submission is The Hand of Gulliver the Man-Mountain. It’s a roleplaying game where Lilliputians explore the hand of Gulliver who just washed ashore. 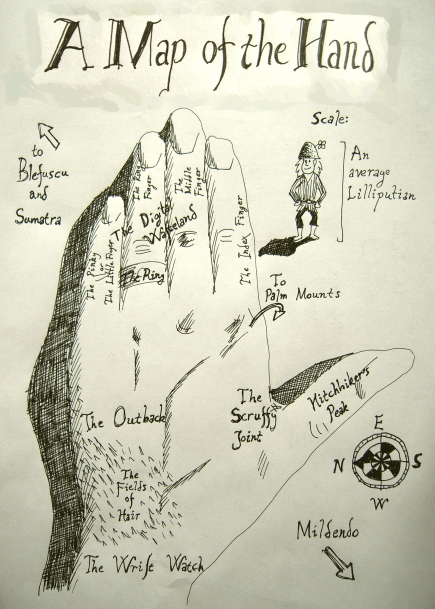 Your finger represents your Lilliputian character, and the Game Master’s hand is the Hand of Gulliver the Man-Mountain.